Welcome to the Garden Spot Village Kids Marathon sponsored by ELANCO Public Library and Garden Spot Village 1/2 Marathon and 10K. Garden Spot Village and ELANCO Public Library teamed up to promote healthy lifestyles for kids 6 to 12 in Kindergarten through 8th grade. The kids not only benefit from the activity and training but they get to experience the thrill of a marathon start and finish, coming down through the same finisher’s chute that the runners will use the following day with cheering crowds, medals and all. 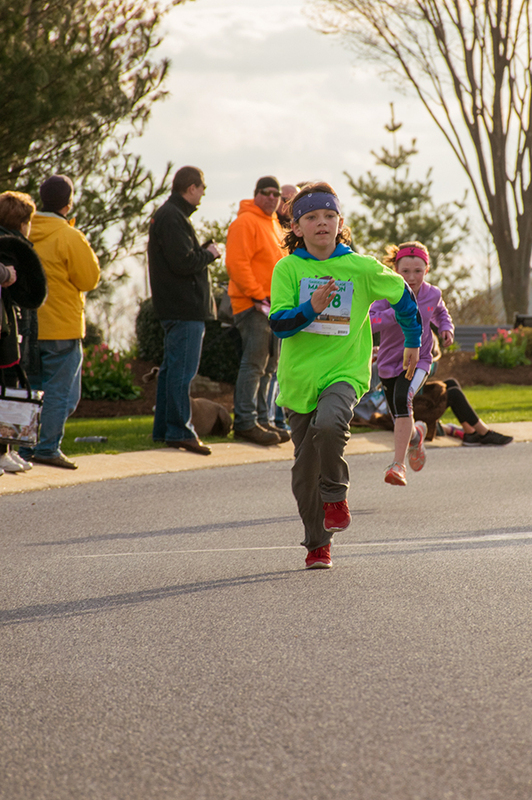 After registering for the Kids Marathon the young man or lady must complete 25 miles of running, walking, bicycling, or swimming before April 5th, 2019. Completion of the 25 miles is based on the honor system. How and when and where they do the 25 miles and how much they do at a time is totally up to them as long as it all adds up to 25 miles. Click here to Print the Get Up and Go tracking log. On April 5th at 6pm the runners will line up on the starting line (parents are welcome to run with them) and run the final 1.2 miles of the marathon distance of 26.2 miles. They will come down the finishers shoot where there will be a time clock and they will receive a finisher’s medal after crossing the finish line. The kids will get a t-shirt and a unique numbered bib as a part of their registration fee and the finisher’s medal. Like most races, the official photographer of the Garden Spot Village Half Marathon and 10K, US Candids, will be taking photos that will be available for purchase by bib number on their website. The idea is to not only get kids active, but to introduce them to running and give them as authentic of a big race experience as possible.